Remote Time Lapse Setup Ready for Snow Season! I shoot a lot of time lapses. I use several different cameras, depending on the situation, but the best is my trusty old Nikon D90, with an Aputure AP-TR3N digital timer (intervalometer) (because the D90, stupidly, doesn't have an internal timer). This setup, along with a Nikon external power supply and a 16GB memory card, works great, and is responsible for many of my time lapses, which you can see here. There are, however, a couple problems with the weatherproof setup. 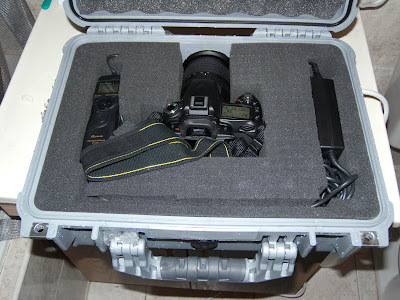 First, once the camera's in the case, it's pretty hard to compose the shot, or even check the focus. Secondly, the only way to check on the camera once I start the time lapse is to dig to the bottom of a snow drift and open the case, which messes things up. Not checking means that the camera could run completely out of memory and I'd have no idea. So, when I saw that the Eye-Fi card--which adds a wi-fi connection to a memory card--had an "endless memory" feature, I bought one. The idea of the endless memory feature is that as files are wirelessly transferred off the camera to a remote computer, they are automatically deleted from the card to keep the maximum memory utilization at some level you preset using the Eye-Fi setup program. In testing, I had a bit of difficulty getting a wireless connection to the card with the camera on the roof, and this was made more difficult by the fact that there's apparently no way to monitor the signal strength until photos stop coming in to the Eye-Fi software running on the computer. But for the test, I moved my wireless access point to the roof, and got a connection that seemed solid. I tested the setup shooting a time lapse of the Tribute in Light (photos from a previous year here), but the time lapse stopped in the middle of the night--when the 8GB Eye-Fi card filled up. Suspecting a flaky wireless connection, or a software failure, I did a bunch more testing over several weeks, but I didn't figure out what went wrong until I saw a great Burning Man time lapse by Matthew Goodman. 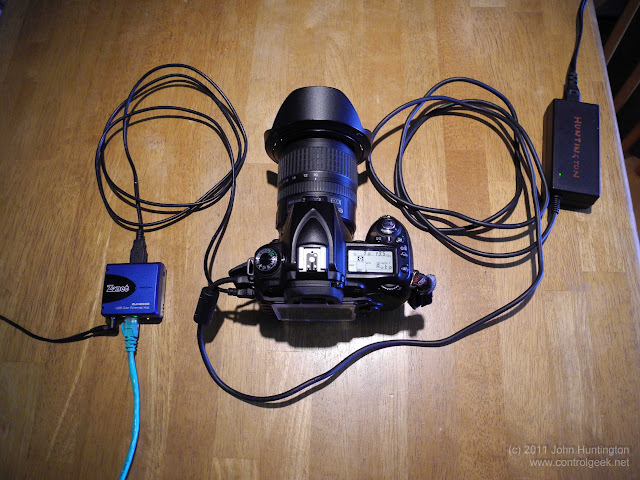 In his writeup of his setup, he said, "Eye-Fi cards come with an extremely annoying, totally undocumented feature. Namely that they require a hardware reboot (or several) to delete photos." I searched all the Eye-Fi documentation and couldn't confirm this functionality, so, I got in touch with Mr. Goodman and he pointed me to this Eye-Fi tech support thread which confirmed the problem. For the endless memory feature to work, the camera has to be completely powered on and off several times. This "feature" makes the Eye-Fi pretty much useless for time lapses, and I'm in the process of getting my money back for the card. Update August 2013: The Zonet isn't made any more. I found this on B&B Electronics. I haven't used this device, but I've had good luck with B&B stuff in the past. In my initial tests, connected the Zonet to the camera and through the network used Adobe Lightroom's "tethered capture mode", which continuously transfers pictures off the camera and into Lightroom. Using my intervalomter, the whole thing worked great--for a while. After 100 frames or so, inexplicably the D90 would stop shooting. I tried going direct USB without the Zonet, and got the same problem again, which I documented in a crappy video you can see here) I sent the video to Nikon technical support, and they said couldn't respond because they "don't support non-Nikon products". I thought this was pretty ridiculous, since it was the camera itself that was freezing, and Lightroom is hardly a fringe shareware software program. Remote control of the camera. Continuous download of images (which can be automatically opened in Lightroom using the "Auto Import" feature) and backup onto the memory card if the Zonet fails. Remote viewing from the camera so that I can reframe, compose and check focus without opening my weatherproof box. 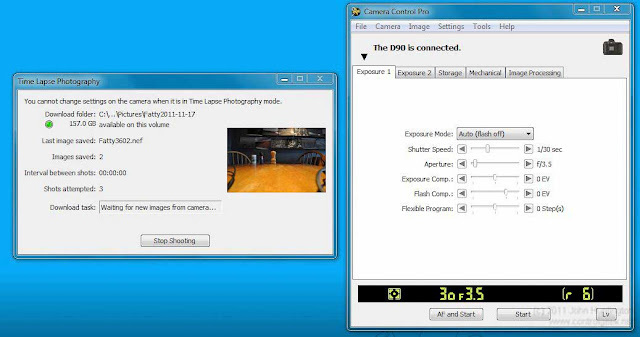 Ability to make partial time lapses of a long sequence of frames without disturbing the camera (all the frames reside on the computer all the time). 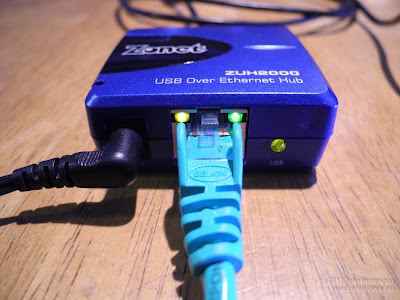 Reliable connection via Ethernet and TCP/IP. No need for an external (battery powered) intervalometer. Peace of mind--I can always tell if the unit is working. 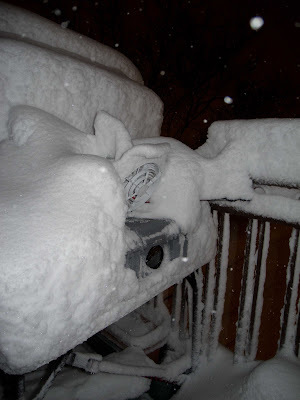 We'll see how this holds up for the next snow storm, but so far so good!